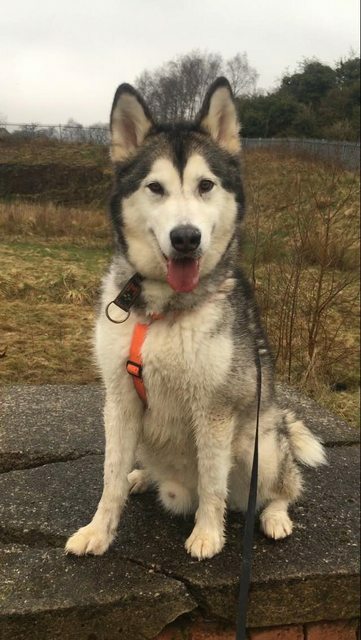 Meko is a 4 year old male Alaskan Malamute and would suit an active family. He enjoys Cani cross and would make a great working dog. He cannot be homed with cats or small furries. Older dog savvy children only who are use to dogs. Meko is good with other dogs and loves his toys and is very food motivated. Saints Sled Dog Rescue (registered charity no. sco44070) rehome and rehabilitate Siberian Huskies and Alaskan Malamutes across the UK. For further details about adopting a dog from Saints Sled Dog Rescue please email info@saintssleddogrescue.co.uk or telephone 07961880122. Please note, all dogs rehomed from this rescue will be microchipped, vaccinated and spayed/neutered. Home checks apply and full post adoption support is offered.